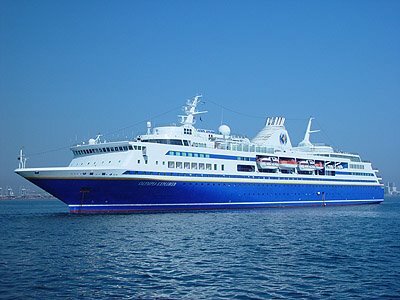 Join me as I go around the world in 100 days aboard this ship! So I know this doesn't really have anything to do with Semester at Sea, but I had to go get one of my wisdom teeth pulled out on Tuesday because I don't have enough room in my mouth. It was coming in at an angle, and you could see the very top of it emerging above my gumline. It had been hurting for quite a few months now, so I decided it was best to do it before leaving for Semester at Sea, or else I would have to put up with the pain for five more months. If I had to give you just one piece of advice, it would be NEVER GET YOUR TEETH PULLED WHILE YOU ARE AWAKE! It was one of the most painful experiences of my life. Now I don't want to scare any of you who haven't gotten your wisdom teeth extracted yet, but they only gave me anesthesia shots like they do when you get cavities filled, except this was surgery, and I felt pain during the whole procedure. The anesthesia only works to numb the gum tissue, tongue, and surrounding area, but it doesn't numb you deep down into the roots where your nerves are. My tooth was impacted too, which means it was below the gums, and they had to slice my gums and dig it out. They actually ran into some complications, and it took an hour and 45 minutes for them to get out that one tooth! They had to call in three different dentists! Actually, a couple of them were only students and one was an intern. I went to the Los Angeles County + USC Medical Center, which is a free clinic, but they have students working on you. It was a walk-in clinic, and I had to wait for over 6 hours in the waiting area to get seen. It was not a very clean place, and you could tell it was a county hospital. I know the government is trying hard to give everybody affordable healthcare, and I respect that. However, I learned the hard way that you get what you pay for (and don't get what you don't pay for- which is quality care!) Every time they wiggled the tooth trying to get it loose, a really sharp jabbing pain would shoot through my mouth and I would jump! The lady was stretching my lip out way too much to the point where she cut it. I kept telling them it was hurting, and they kept giving me more shots of anesthesia, but it didn't help. They told me I had a lot of fatty tissue in my cheeks for how skinny I was, in an attempt to make me laugh. So if any of you are wondering where all my fat goes, it all goes to my cheeks! Anyway, so then it was time to put in the stitches. I heard everything they were saying, and I could see the reflection of what they were doing in their glasses. One of the guys told the girl intern, "Here, you wanna try?" and gave her the needle and thread. I was so scared! I felt like a toy that they were experimenting on. Finally, I was done and got my prescription of Codeine and Penicillin and went home. I couldn't even take my pain killers after the surgery because I had to drive 45 minutes to get home! I just took a few Advils, and put some gauze in my mouth. I had to be a trooper. I wish I had someone to come pick me up or even give me a hug, but that's real life for you! :-( It's hard being all by yourself! I had class the next morning at 8:30am, and I had an internship afterwards where my job is to talk to clients on the phone the whole time. It is extremely difficult to talk when you have stitches in your mouth because certain words/sounds put a lot of strain on your mouth. I am now on the 2nd day after the surgery, and the pain has gone down just a tad bit, but I still have to take my pain killers and put an ice pack on my cheek to keep the swelling down to a minimum. I had wanted so badly to be completely knocked out during the procedure, but they said the only way I could do that was if I got all four taken out at once and that I would have to make an appointment for that, the next available appointment being sometime in August. Since I am leaving town in three weeks and won't be back in LA till January, I had no choice but to get only that one tooth done. When I come back from Semester at Sea, I will get the other three done, but I will make sure I am completely knocked out with an IV in my arm! Soon after that, I will be getting braces. My teeth are fairly straight, but I have one bottom tooth that grew in front of all the others, so I want to get it fixed. Since people tell me my smile is one of my best features, I thought, "Why not make it the best it can be?!"